Texas' voter ID law was designed to thwart emerging minority voting power in the state and should be dropped, attorneys for the law's opponents said during closing arguments in a federal court on Monday. CORPUS CHRISTI — Texas' voter ID law is discriminatory because it was designed to thwart emerging minority voting power in the state and should be dropped, attorneys for the law's opponents said in closing arguments in a federal court on Monday. U.S. Department of Justice attorney Richard Dellheim repeated plaintiffs' claims made throughout this three-week trial that the Texas law, also known as Senate Bill 14, was a "serious solution in search of a problem" and did little if anything to correct voter fraud in the state. In fact, Dellheim and other attorneys representing Hispanic and African-Americans voters outlined in their closing arguments before U.S. District Judge Nelva Gonzales Ramos how the law provides substantial roadblocks for those groups, who would be more likely not to have the kind of photo identification now needed to vote. "SB 14 simply hits hardest those who can bear the burden the least," Dellheim said. Dellheim pointed to data analysis provided by Harvard University professor Stephen Ansolabehere, who found that of the 608,470 Texans who lacked proper photo ID and were eligible to vote, Hispanics were three times as likely not have to have proper ID and blacks were four times as likely when compared with Anglo voters. Passed in 2011, the Texas voter ID law gives state voters a choice among five forms of photo ID — including a driver's license, passport or concealed handgun license — to present to election workers at polling places. 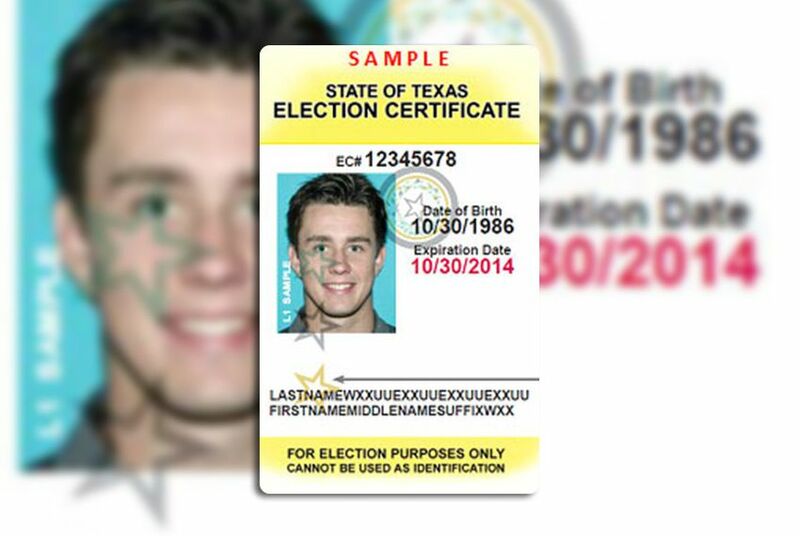 Those without those acceptable forms of photo ID can bring a birth certificate to a Department of Public Safety office to apply for a Texas Election Identification Certificate, or EIC, which can be used at the election polls. Since the law went into effect, only 282 EICs have been issued. Plaintiffs lawyers argued that access to DPS offices is difficult for poorer voters and that basic information about the EICs has been difficult to obtain. "None of the $400,000 spent to implement SB 14 went towards informing Texans about how to obtain an EIC," said Chad Dunn, who represents several minority groups in the trial as plaintiffs. On Monday, plaintiffs attorneys argued that from the start, the state of Texas never made it easy or clear on how to apply for that new ID, one of the many challenges for minority voters. When the trial began earlier this month, plaintiffs had estimated there were 787,000 eligible voters without proper photo ID. During the trial, at least three experts for the plaintiffs estimated that number was lower, between 516,000 to 619,000. But Dunn and U.S. Rep. Marc Veasey, D-Fort Worth, insisted that the exact number is not important. "There is a large amount of people affected by this law," Dunn told Ramos. In his closing arguments, Ezra Rosenberg, who represented the NAACP of Texas and the Mexican American Legislative Caucus, zeroed in on plaintiffs' evidence that showed a series of attempts by Texas lawmakers to thwart the power of blacks and Hispanics as soon as the U.S. census showed in 2004 that they made up the majority of Texas' population. One year later, Rosenberg said, Texas lawmakers attempted to pass their first voter ID law. "At the end of the day, your honor, you have a legislature motivated by the changing demographic," Rosenberg said. Ryan Haygood, who represents the NAACP Legal Defense Fund, added that evidence produced during the trial showed that between 2000 and 2010, Texas added 4 million people and that 90 percent of those were "people of color." The plaintiffs attorneys claimed Texas' strict voter ID law was another in a series of methods used to suppress minority voter turnout. They argued that on average, it could cost $36 to obtain an EIC when transportation costs were factored in with the fees, and compared that to the old $1.75 poll tax in Texas that was struck down in the mid-1960s. Only one attorney argued for the state of Texas, Adam Aston, the principal deputy solicitor general with the attorney general's office. He argued that the plaintiffs failed to prove there was evidence of "intentional discrimination." Merely having witnesses testify that there were concerns about discrimination was not enough, he said. And he also argued that 98 precent of the population had access to a DPS office within 25 miles. "The critical question is what the actual effect SB 14 will have on actual Texas voters," Aston said. Correction: An earlier version of this article misquoted U.S. Department of Justice attorney Richard Dellheim. He called the voter ID law a "serious solution in search of a problem," not a "serious problem in search of a solution."